Moving from the Liverpool Pleasure Dome to the Manchester Program Room, it’s FRANKIE GOES TO HOLLYWOOD, soon to be starring in a new OCEAN game by DENTON DESIGNS. In the good old days the word ‘crossover’ was used when ‘underground’ disco music crossed over from the dance charts to the main stream chart. Today, everyone seems to be crossing over from everywhere. Chart toppers Frankie Goes to Hollywood are among the latest and have placed their reputation in the hands of Denton Designs who are developing the game Frankie for Ocean. The aggressive marketing techniques of Frankie’s creative producers, ZTT has been much in evidence and, together with Island Records they set up the deal with Ocean’s David Ward, with the three companies sharing the revenue from sales of the game. (Oh and Frankie Goes to Hollywood get a cut somewhere along the line.) 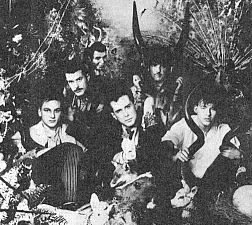 Frankie’s Svenghali Paul Morley of ZTT, has apparently contributed to many of the initial ideas for what Ocean describes as a new concept in entertainment publishing. No details yet on what the game will be like except that it’s described as a ‘Spectacular’, and is scheduled for an early Spring release at a price of £9.95. Better get in an order now for what must be the inevitable t-shirts bearing a legend like, ‘Frankie Says No More Shoot Em Ups’. ALIEN programmer PAUL CLANSEY gets a helping hand. The film Alien became something of a cult almost as soon as it was released. Now Spectrum owners can entertain themselves with a new strategy game based upon the movie. Alien from Argus Press Software is the latest in their ‘Mind Games’ series. The game represents a breakthrough in programming techniques, says Argus. This is the first program of its kind where the player has to relate not just to coloured blobs on the screen, but to people. In order to succeed you have to learn how to manage people, understand people and predict how people will behave. Inside the space tug Nostromo you have seven distinct personalities and a cat. Your task is to command the crew and prevent the Alien from reaching Earth. The game opens at the point in the film where the Alien has killed one crew member by tastefully hatching from the victim’s chest. The crew member attacked changes each game. The Alien can be killed by driving it through the airlock or by blowing up the Nostromo. You can escape with three crew members on the shuttle providing nothing is left alive aboard the Nostromo. The programmer is Paul Clansey who comes from Liverpool and is a self-admitted Alien fan. He has tried to remain faithful to the spirit of the film, whilst allowing the player to alter the film’s outcome dramatically in the game through gameplay. Alien is joystick driven (or via the keyboard). The Nostromo has three levels into which you can move any of the crew. These are controlled one at a time while others are completing their tasks, although one of them is a robot who wants to help the Alien. The game comes in a large style video case with a 16 page booklet including stills from the film and a guide to the story and game, and it costs £8.99. We’ll have a review next issue of the Spectrum version. With the horrors of Imagine behind him and no longer having to struggle with the completion of BANDERSNATCH, programmer John Gibson can relax with the other members of his team at DENTON DESIGNS. The team are at work on a new program for Ocean about the pop group FRANKIE GOES TO HOLLYWOOD as well as other projects for BEYOND. 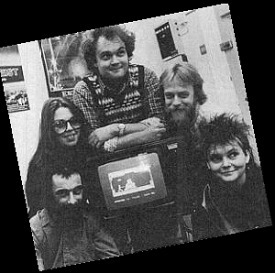 The picture shows (left to right) JOHN GIBSON, graphics specialist KAREN DAVIES, STEVE CANE — also graphics, systems designer KENNY EVERITT, computer graphics artist ALLY NOBLE, and on the TV screen, hero of their latest game GIFT FROM THE GODS, Orestes thrusting his sword at a pile of screaming skulls. Since the successful hit game Splat, Incentive Software have concentrated on adventure games for the Spectrum like the Ket Trilogy or strategy/simulations like Millionaire. But Incentive’s managing director Ian Andrew says that more emphasis will be placed on arcade games again in 1985. Ian himself is something of an arcade freak, living in a house full of arcade video machines and pinball machines. The first such is a Spectrum version of an arcade original which has been a great favourite, and yet has never been done on the Spectrum. 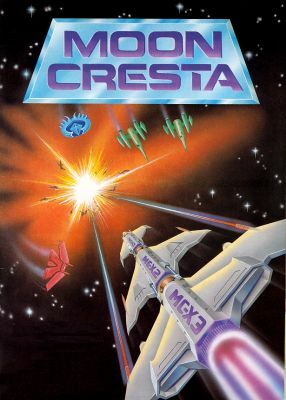 It is Moon Cresta, a furious and difficult shoot em up. Moon Cresta is officially licenced from Nichibutsu (Arcade Game) and should be released in March at around £6.95. In some senses Moon Cresta is a Galaxo-variant in which aliens swoop down on your space ship in lethal patterns, firing as they come. A between-waves sequence requires you to dock your fighter craft with the main body of your ship while both sections are moving about in space. A sneak preview at the CRASH offices revealed a Spectrum version with true to the original graphics and tunes and levels of play which should suit everyone right up to fiendishly difficult. Incentive will be running a competition in conjunction with the game for the winner to receive an original Moon Cresta arcade video machine. Of the following release, Ian is more cautious and won’t say any more at the moment other than it will be a highly original arcade game in much the same way that Splat was original. W H Smith is now offering credit facilities to customers buying computers at its High Street Computer Shops. Credit is available for purchases of computers, software and accessories to the total retail value of between £400 and £2,000, 10% of which must be paid as a deposit at the time of purchase. Products wanted by customers on credit need to include an item of computer hardware. Repayments may be made over 12, 14 or 36 months. The scheme includes all the 50 plus Computer Shops excepting the two at Heathrow Airport, but is not available at W H Smith computer departments. Shortly before the Christmas break Paul Dyer of Fantasy Software presented a specially made ‘Backpackers’ clock to Bob Hamilton, author of Fantasy’s latest success, the Backpackers Guide to the Universe, at a celebration in Cheltenham held to mark the game that nearly didn’t make it. Explaining the reasons for the celebration, Paul said, ‘We have built our reputation on producing only a small number of very good games. But to maintain that reputation we have to deliver on time. Although Backpacker has done very well in the charts, having sold a claimed 23,000 copies in its first month, Paul and Bob are unable to relax as parts two and three of Backpackers are in production for releases during 85. Cambridge Computing, best known for their software programmable joystick interface, have ceased trading. There had been rumours earlier in the year that the company was in financial trouble after sales of their interface had virtually dried up. Development of the neat SLOMO device for altering playing speeds of computer games, came too late to save their sinking fortunes. The company has gone into Voluntary Liquidation. Currah Computer Components, manufacturers of the well known speech device the Currah Microspeech unit, have also run into financial trouble and been taken into Receivership. First inclinations of a problem in the company, which claimed tens of thousands of sales for the Spectrum unit within the first six months, came when dealers found themselves being invoiced by Currah’s suppliers of electronic components instead of direct by Currah themselves. Shortly before Christmas, we discovered that Receivers had been appointed to handle the company’s affairs, although in the first days the Currah receptionists were not admitting to the fact as they are required to do. Currah had been developing a number of follow-up products to the Microspeech unit — the Microslot motherboard has been on sale for several months — but now the future of these products is in doubt, although several hardware manufacturers are known to be interested in acquiring the rights to them. We published a letter three issues ago from a reader warning that ISP, the people marketing the graphic utility Scope, had gone bust. This was true. However the program is still available and going strong, according to CodeWriter Ltd of Basingstoke, who not only took over the marketing rights of Scope, but also ISP’s consumer liabilities. Graham Lomax of CodeWriter (part of the CodeWriter Corporation of Chicago) told us that they have acquired all the ISP product range. They have also been fulfilling orders left by ISP, but it has taken time to go through the outstanding orders. By this time all ISP customers still waiting for product should have either received it or have been sent a communication. Delays have also been occasioned by the time it takes for a liquidator to release paperwork and stock, but that this was completed about ten weeks ago. CodeWriter have also taken up the ISP User Club, which has meant changing the club membership cards to include the new details. CodeWriter can be reached at Basingstoke, Hants, but are presently relocating their offices some thirty miles away in Berkshire. THE INCREDIBLE HULK was on hand to give his colleague SPIDERMAN a helping hand when ADVENTURE INTERNATIONAL delivered the first batch of tapes for their new release to the headquarters of Microdealer UK in Welwyn Garden City. SPIDERMAN is another Scott Adams adventure with stunning graphics for the 48K Spectrum retailing at £9.95. Continuing on their departure route from text-only adventures Level 9 have released a new graphical adventure called Emerald Isle with over 150 different pictures. The plot concerns the pilot of a light aircraft who has been forced to parachute down to a lush tropical paradise after a meeting with something strange in the Bermuda Triangle. Unlike most Level 9 adventures, the problem is not survival but how to get away from the lovely island. This one’s priced at £6.95. Datel Electronics have announced the release of the Digital Sound Sampler for the Spectrum computer. The slimline device plugs into the user port and comes complete with a software package to facilitate a host of sampling techniques. The D.S.S. allows the Spectrum user to record digitally into Spectrum memory, any sound like a voice, drums, instruments etc., and then play this captured sound back with almost limitless variations. These include conventional playback, forwards, backwards, ascending-descending pitch, expanded and compressed (to make ‘Donald Duck’ or ‘Darth Vader’ type sounds) with echo — endlessly looped. Further software for ‘on screen’ voice-prints and pitch analysis, together with a program to incorporate effects into your own games, is also included in the software package. Datel say that they feel strongly that the end user has been previously exploited as they see similar products with no more technical sophistication than their own selling at unbelievably high prices. Datel claim that by using the D.S.S., an entire piano concerto can be written by recording just one piano note! The Digital Sound Sampler retails for £49.99. For those fascinated by statistics, Mike Simpson, the P.S.S. programmer responsible for the development of Swords and Sorcery has announced that the program contains 86 monsters, 635 locations, an 800 word dictionary, almost 2,000 objects and in excess of four million ways to be insulted. Mike, who has already spent over 18 months in the planning and development of the program, has also revealed that it will be run in Real Time, be fully menu driven and the player will be able to control weapons during combat sequences. Swords and Sorcery is available for the 48K Spectrum at £9.95, but the lady in the photograph is only available on the Amstrad version. Many Spectrum owners have recognised that the hallowed Microdrive has its drawbacks, although it still remains the cheapest method of expanded memory storage and fast access. But for those who wish to really expand the use of their Spectrum, there are a number of superior disk drives around. One of the latest is also British and comes from Thurnall Electronics. For the asking price of £219.95 (including VAT and delivery), Thurnall offer a standard Hitachi disk drive with the popular 3 inch ½-Megabyte disks. The drive is compatible with all known Spectrum software, with Microdrives, Interface 1, all known printer drivers and joysticks. It comes supplied in one box with all necessary leads, manual, disk with introductory programs and a money back guarantee if not satisfied. It is available direct from Thurnall Electronics, Manchester. Jet Set Willy almost met his match when a fire broke out at the Bear Brand estate where Software Projects have their headquarters on the outskirts of Liverpool immediately before Christmas. Fears that Software Projects had gone up in a puff of smoke were laid to rest with a phone call. The fire had broken out in an adjacent unit, part of a kitchen furniture factory, and Software Projects were in no real danger, although thick smoke forced all the staff to evacuate their premises. SP’s managing director, Alan Maton told us that the smoke had made a mess of things and their telephone system was not operating properly for some days, but stock, masters and computer equipment were all safe. The cause of the fire has not been firmly established, but was believed to have been started in the electrical wiring of the kitchen factory unit. The Advertising Standards Authority have upheld complaints made by two members of the public over the advertisement published in CRASH for Silversoft’s Worse Things Happen At Sea. The advertisement was headlined, ‘FOR ADDED REALISM PLAY THIS STANDING IN THE BATH’. The complainants considered that in the context of a game likely to appeal to children, the advertisement encouraged a disregard for safety. It is, of course, considered dangerous to take any electrical appliance into a bath full of water. Perhaps the answer is for Sir Clive to be the first with a gas or steam operated Spectrum. No action has been taken against Silversoft as the advertisement was withdrawn on request, although too late to avoid being printed in the December issue of CRASH. Unicom’s Modem is now in full production after experiencing some delays, but Marketing Director Mark Simon is confident that they can meet all January’s orders. The Unicom Modem features auto baud rate sensor, auto dial, auto redial, full and half duplex and comes complete with power supply, leads and manual at a cost of £49.95 excluding VAT. Software for the Spectrum is expected by mid-January. Modems have been very expensive until recent low cost models began to appear, and although general reliability of information transfer is still uncertain due to telephone line interference, the use of modems is increasing. British Telecom have recently launched a trial service which will give modem users something constructive to do with their units. The trial service has actually been launched by Your Computer magazine supported by British Telecom East. By simply making a phone call, Spectrum owners who possess a modem will be able to download a selection of software programs published in Your Computer, and save a good deal of laborious keying in. One of the programs which is immediately available is a communications package entitled Dialsoft, which will enable users to communicate with each other via the keyboard and transfer data or programs. British Telecom say that a 6K byte program should take about one minute with a 1200 bit/second modem. No membership or subscription fees are required. Details of the telephone numbers to call, and for the programs currently available for downloading, are now available on a new recorded information service Microline.